Merry Christmas! We had a wonderful Christmas this year. 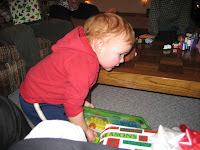 As in years past we visited my side of the family on Christmas Eve and enjoyed pizza, just as we've done before. What a fun tradition! My brother's family was also there, and Grandma & Grandpa Resler. All the kids had a great time passing out gifts, and then opening their own gifts to see what special present they'd received. Christmas day we exchanged gifts just the four of us, and "Santa" brought exactly what Meadowe wanted, the "Wall-e" movie. 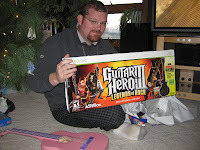 So we watched it while we opened the rest of our gifts. 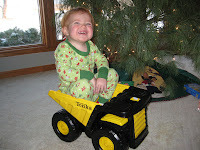 Finn got a big Tonka dump truck and Ora finally got Guitar Hero. 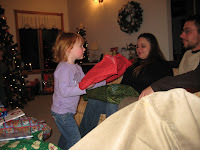 After we opened our presents at home, we went to Ora's parents to open gifts there and have breakfast. At his parents, we also exchange gifts with Ora's brother and his family; and Ora's grandparents, Pap & Moo, were there as well. It's a little crazy with four kids 5 years old and younger ripping open wrapping paper and showing off their new present. In the afternoon we all visited Ora's uncle & aunt and their growing family for more food and great conversation. I say growing because recently one of Ora's cousins got married, and had a baby, and another cousin has a wedding date fast approaching. What a lovely couple of days spent with family. We are so blessed to have family near and dear to us. Hi! Welcome to the first installment of my new blog. I'm excited to start this and I hope you enjoy it too. I want to share with you our life here at Cindonway. I am Jill, and I live here with my children, Meadowe & Finn, and my husband, Ora (pronounced Or-ee). Meadowe is 3 1/2 and Finn is almost 22 months. We live where we do because Ora is an avid competitive water skier and our location allows him to water ski pretty much any time all summer long. I love being here because the lake is right outside our door and it's a nice place to raise our 2 children. We also have a dog, Murray, who is 5 1/2. He loves living at the lake too! This first picture is almost a year old, but it's the most recent of all 4 of us. 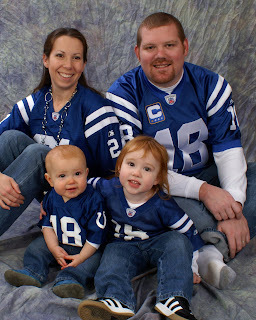 Oh, did I mention we are a Colts family? !